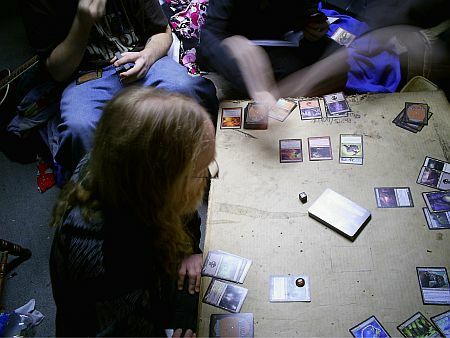 The Magic, The Gathering, what is this and why are my children playing it obsessively? The simplest answer is that it�s an awesome game played with cards. 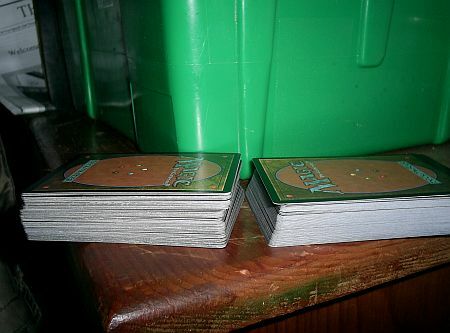 The cards are used to attack and defend the players, each of whom will be playing with their own unique deck, there are LOTS of different cards that have been made since the game was released in 1993, many thousands of them, but you are allowed to play with only 60 at a time. Regardless of the 60 cards you use, there will still have to be an order in which they are released, you start with seven and they are played one per turn unless paid for by mana cards. Mana, for the non-gamers out there is the unit used to describe magical power. Sounds simple so far, Hah! There are different types of mana, blue from island lands, red from mountain lands, green from forest lands, white from plains, and black from swamps. Huh, those are only the basic lands. There are lands you can even turn into creatures, and spells that let you do the same thing! Dave�s first �Magic, The Gathering� card purchase. �Creature� cards are put into battle at a mana cost which is often a combination of one colour, plus any other colour, there are exceptions! Still simple, Hah again, there are more than just creature cards involved. Artifact cards, sorcery cards, enchantment cards, instant cards most of these cost mana cards to play. Each creature has it�s own attack and defense ability, a �Horned Turtle� is at 1/4 meaning it is big on defense while a �Kelinore Bat� is 2/1 meaning it attacks better than it defends, it is also a flying creature and can only be hurt by other flying creatures or creatures with �Reach� ability or by spells. Cards are turned sideways to indicate that they have been �tapped� or drained of their power or available activity for the round. �Tapped� cards cannot be used until they are �untapped� at the beginning of each players turn, again there are exceptions that are dictated by the cards, I could enchant a creature and it will not �untap� until another card destroys the enchantment or until the next round depending on the nature of the enchantment card. If you tap a card to attack, you cannot usually use it to defend when it is your opponent�s turn unless the creature has �vigilance�. The way in which creatures are modified are countless, artifacts put into play can be combined with enchantments that may modify the creature cards or the player or other artifacts or spells. A mosquito can be imbued with the power of a dragon given the right modifiers and could then be instantly returned to the deck, the players hand, the graveyard or be permanently removed from the game if the right �instant� card was played; the same creature card could also be placed under opponent control by an �enchant creature� card. The simplest sounding card game is very complicated. There is no quest, just combat, no lengthy instruction manuals, just an endless number of cards with instructions on them and an order of playing. Also, the amount of time required to finish a game can be quite short depending on the number of points a player is given to start (20 is normal, but you can make it whatever you like). Another way to lose is to run out of cards by drawing everything from your deck/library, and there are cards that influence this as well sometimes making an opponent discard every turn or in response to another cards influence, there are also cards that will allow an opponent to bring cards from their graveyard or discard pile and add them into play or randomly into their library, the number of cards you are allowed to hold in your hand is also susceptible to change when certain cards are played, however until they are played you are allowed seven cards max. 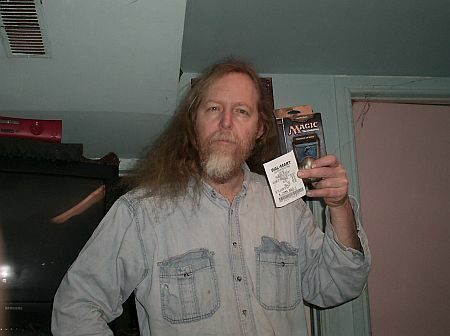 The cost is whatever you would like or can afford to spend, I invested $18.55 buying my first deck, this gets you enough to play, being a �core� deck it favors a color (mine was blue) and included 41 cards that all �core� decks would have in common, the deck also comes with a sealed �booster� pack that comes with 15 cards that can be anything. 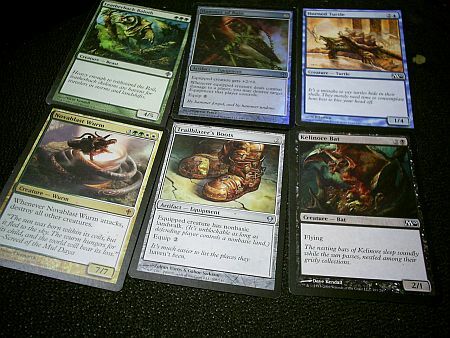 Cards I traded for a single Planeswalker card are on the left. There is a lot that is taxed when you play this game, your memory (trying to remember what a card does instead of relearning), your eyesight (reading the fine print on a card) and your brain in trying to figure out what is best to do when attacking or being attacked. But most importantly your wallet will be emptied if you follow obsession to the fullest and attempt to get all 10,000+ cards. Two weeks have gone by since I started writing this, I have since played more Magic and am quite enjoying it, if your deck is weak against one wielded by an experienced user, just wait, there is always a chance for victory, mana cards come out in fickle fashion and no victory is guaranteed if your decks have any kind of �teeth� at all. 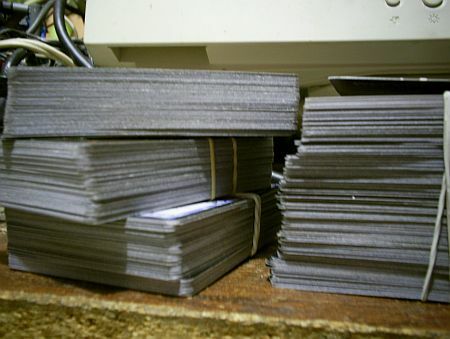 Now I have almost 400 cards after total investment exceeds $60. Next Morning (Saturday, two weeks later) - I am going three ways on a �booster box� that will cost me about $40 and provide 12 packs of 15 random cards. Next day � from these booster packs I have assembled three working decks, one blue-black, one red-black and one green-white, my coolest card is a �nova burst worm� who, when he attacks kills all other creatures! (bottom left is a nasty creature). I can win the odd game now, having learned the basics and got lucky a few deals, generally if your mana cards are slow to come out, you have much less chance of victory but all mana will get you nowhere fast. Learning not to make silly mistakes is also important, playing a weaker card against stronger is usually a silly mistake, trying to remove an artifact with a �remove enchantment� card is also a silly mistake, forgetting to attack when it�s relatively safe to do so�. There are Magic tournaments held regularly throughout the world and players estimated to be several million in number, I think it�s complicated as hell but very fun, the potential costs in dollars to put together that perfect deck could get crazy. I will continue to take challenges with my existing cards and will probably re-distribute what decks I have made, trying to put together a nearly unbeatable combination. 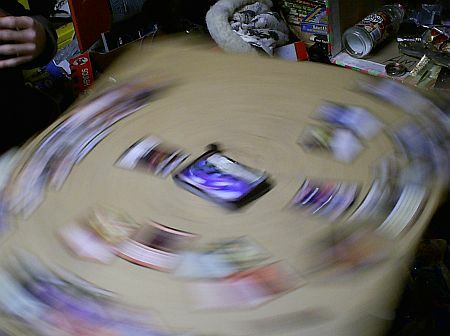 Spinning Table or Vortex Spell intruding on reality? Try this game out it if you dare, you will need someone to play with. If there persons you know interested but not yet initiated, you can all buy workable decks for under $20 each. Having teachers is useful but the instructions are simple� in that the cards explain everything, it�s important to get the order of play right and learn about tapping and untapping cards to use them� and booster packs, however expensive, are fun to open! Defending player chooses �Blockers�, creatures who will block your army�s way. Defending player chooses which blocking creature blocks each attacking creature. One turn is over, now the other player does the same sequence (End Step). Permanent: Any creature, Enchantment, Artifact, or Land. Spell: Every non-land card is played as a spell. If it is a permanent, it becomes a permanent it loses spell status the next turn. Enchantment: A spell placed on a creature or permanent that affects it as long as the enchantment is in play. Sorcery: A spell that affects a creature or a player once, goes to the graveyard after being played, and can only be played during your main phases. Instant: A spell that affects a creature or player once, goes to the graveyard after being played, and can be played any time, even during your opponents� turns. Flying: Ability, creatures with flying can only be blocked by other creatures with flying, and creatures with reach. Reach: Ability, creatures with reach can block creatures with flying. Trample: Ability, creatures with trample�s combat damage to a player is not immediately stopped by another creature blocking it. You must stop all of it�s power, or kill it, otherwise it will keep on going to it�s target. Vigilance: Ability, creatures with vigilance do not tap while attacking. Landwalk: (Island, mountain, swamp, forest, plains, non-basic, or legendary): Ability, creatures with landwalk are unblockable as long as defending player controls that type of land. Devour: Ability, creatures with devour can eat your other creatures when they enter the battlefield, gaining strength. Mana and tap abilities: creatures with mana or tap abilities may use those abilities as though they were instants, as long as they are untapped, and you have the required mana.